Rabbit anti Sheep interleukin-8 antibody (AHP425) used in conjunction with Mouse anti Sheep interleukin-8 antibody, clone 8M6 (MCA1660 ) for the measurement of bovine CXCL8 in embryonal bovine lungs by ELISA. Analysis of bovine TLR5 activity in bovine epithelial cells. The bovine EBL cell line was stably transfected with a bTLR5 clone and CXCL8 secretion assayed following challenge with flagellin. (A) CXCL8 levels from EBLs with and without transfection of bTLR5. H7 flagellin at a range of concentrations was added to the cells and CXCL8 levels were measured by ELISA following overnight incubation. 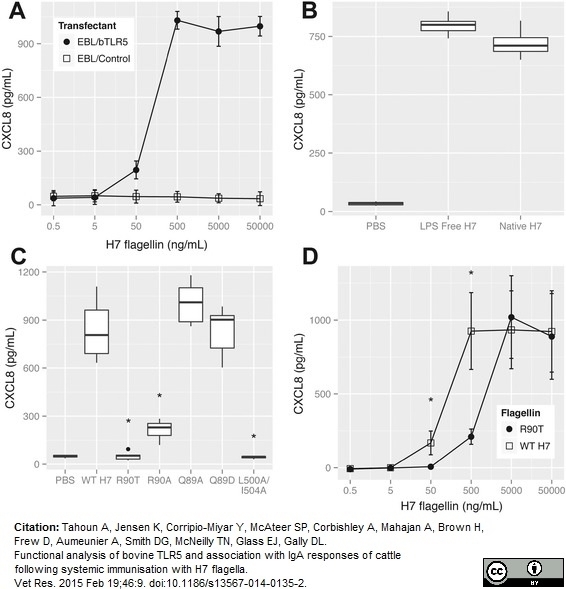 Transfection with bTLR5 resulted in significantly higher levels of CXCL8 being produced by the bTLR5+ cells with addition of 50-50,000 ng/mL of H7 flagellin (p < 0.001). The data shown are the means and 95% confidence intervals. (B) Analysis of CXCL8 production from EBL-TLR5 in response to addition of native H7 or an H7 flagellin preparation from which the majority of LPS has been removed. Medians and interquartile ranges are shown. (C) Secreted CXCL8 following addition of WT and mutated H7 flagellins to EBLs with transfected bTLR5. 50 ng/mL of WT-H7 and mutated flagellins were added to the EBLs transfected with bTLR5 and incubated overnight. CXCL8 was measured by ELISA. Addition of the R90T, R90A and L500A/I504A variants led to significantly lower levels of cytokine release (p <0.001) relative to WT-H7 stimulation (asterisks). R90T showed a significantly lower induction than R90A (p <0.001). Medians and interquartile ranges are shown. (D) Secreted CXCL8 following addition of WT H7 and the R90T flagellin mutant to EBL cells. A range of flagellin concentrations was incubated overnight with the cells and CXCL8 measured by ELISA. R90T flagellin demonstrated significantly reduced levels of CXCL8 activation at 50 ng/mL and 500 ng/mL (p <0.001), marked by asterisks. The data shown are the means and 95% confidence intervals. All CXCL8 data shown is from a minimum of three biological replicates. From: Tahoun A, et al. Functional analysis of bovine TLR5 and association with IgA responses of cattle following systemic immunisation with H7 flagella. Vet Res. 2015 Feb 19;46:9. Rabbit anti Sheep Interleukin-8 antibody recognises ovine interleukin-8, also known as IL-8, C-X-C motif chemokine 8 or Chemokine (C-X-C motif) ligand 8. Interleukin-8 is a 79 amino acid ~11kDa secreted cytokine chemotactic for neutrophils, basophils and T-cells but not monocytes. No cross-reactivity is seen with ovine IL-1 beta, IL-6, MCP or TNF alpha. Antisera to ovine IL-8 were raised by repeated immunisation of rabbits with highly purified antigen. The antibody may be used in a sandwich ELISA as a detection reagent for ovine IL-8, in combination with MCA1660 as capture antibody. N.B. It is recommended that AHP425 and any detection antibody are diluted in 10% normal mouse serum prior to use in ELISA. Caswell, J.L. et al. (1998) Expression of the neutrophil chemoattractant interleukin-8 in the lesions of bovine pneumonic pasteurellosis. Vet Pathol. 35 (2): 124-31. Physiol Genomics. 44 (7): 403-16. Shashikant, B.N. et al. (2005) Dose response to rhCC10-augmented surfactant therapy in a lamb model of infant respiratory distress syndrome: physiological, inflammatory, and kinetic profiles. J Appl Physiol. 99: 2204-11. Doull, L. et al. (2015) Late production of CXCL8 in ruminant oro-nasal turbinate cells in response to Chlamydia abortus infection. Vet Immunol Immunopathol. 168 (1-2): 97-102. Stinson LF et al. (2014) Effects of cytokine-suppressive anti-inflammatory drugs on inflammatory activation in ex vivo human and ovine fetal membranes. Cronin, J.G. et al. (2015) Enzyme linked immunosorbent assay for quantification of bovine interleukin-8 to study infection and immunity in the female genital tract. Am J Reprod Immunol. 73 (4): 372-82. Tahoun, A. et al. (2015) Functional analysis of bovine TLR5 and association with IgA responses of cattle following systemic immunisation with H7 flagella.